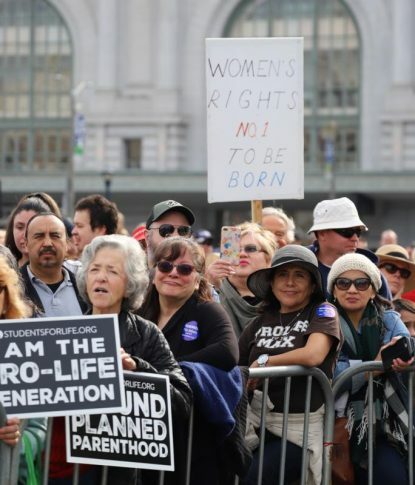 SAN FRANCISCO (CNS) — A throng of upbeat pro-life supporters, some from as far away as Colorado, Arizona and Tennessee, swarmed the streets of downtown San Francisco Jan. 26 carrying a wide array of messages calling for an end to abortion. There were a handful of spontaneous hecklers, including a man who stood near the cable car turnaround on Market Street and shouted, “Go to hell” at the procession. But neither he nor a costumed group of about a dozen more organized counterprotesters distracted the walkers, many of whom smiled and waved at the provocateurs. Other speakers included Patricia Sandoval; the Rev. Walter B. Hoye, founder of Issues4Life; Father Shenan Boquet, president of Human Life International; and Abby Johnson, a former clinic director at a Texas Planned Parenthood who is the subject of the movie “Unplanned,” scheduled for release in March. Sandoval, who had three abortions, was hired by Planned Parenthood to work as a back-office nurse without nursing credentials. “I was manipulated and trained to lie to women that it was not a baby,” she said. She turned to cocaine and eventually fell homeless before a conversion experience with a stranger saved her. No words were required for Katie Forbes’ sign. The Arizona State University student’s exposed belly featured a life-sized painting of her unborn child, Timothy, due in May. “There is nothing better than an ultrasound to get the pro-life point across,” she told Catholic San Francisco, newspaper of the Archdiocese of San Francisco. Forbes said as the oldest of eight children from a Catholic family, her values were put to the test when she found herself pregnant and unmarried at 20. “It was a lot more personal,” she said. Jim King from Memphis, Tennessee, who became a Catholic over 40 years ago, said his active opposition to abortion grew after he stopped into a Catholic church between business meetings. Californian Ruth Enero, who traveled with members of her church in Modesto, held a handmade sign that read, “Embrace a Consistent Ethic” on one side, and “Value Every Life” on the other. She opposes abortion, war, death penalty, euthanasia and racism and poverty. The Walk for Life West Coast was one of the last January pro-life marches marking the anniversary of the 1973 Roe decision, which with its companion case, Doe v. Bolton, legalized abortion virtually on demand. Pro-life marches were held in dioceses across the country, with the national March for Life taking place in Washington and drawing more than 100,000 Catholics and others from all over the country. In Indianapolis Jan. 22, the actual Roe anniversary, 900 people gathered for a Mass celebrated at St. John the Evangelist Church. Afterward, roughly 600 pro-life advocates from around Indiana marched a mile for life in 22-degree wind chill. He concelebrated the Mass with Bishop Timothy L. Doherty of Lafayette-in-Indiana and more than a dozen priests from the archdiocese and diocese, which both sponsored the day’s events with Right to Life of Indianapolis. In a statement released Jan. 22, which also was a National Day of Prayer for the Legal Protection of the Unborn, Florida’s nine Catholic bishops said the church’s teaching on abortion is continuously proving to be prophetic. Gray is associate editor of Catholic San Francisco, newspaper of the Archdiocese of San Francisco. Contributing to this story was Natalie Hoefer, a reporter at The Criterion, newspaper of the Archdiocese of Indianapolis.